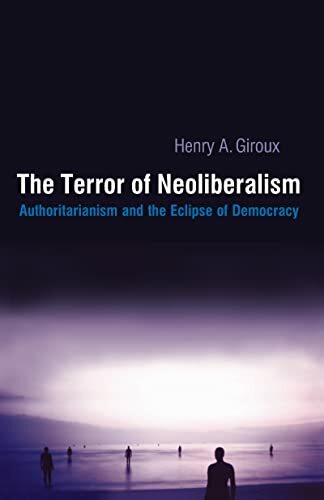 This book argues that neoliberalism is not simply an economic theory but also a set of values, ideologies, and practices that works more like a cultural field that is not only refiguring political and economic power, but eliminating the very categories of the social and political as essential elements of democratic life. Neoliberalism has become the most dangerous ideology of our time. Collapsing the link between corporate power and the state, neoliberalism is putting into place the conditions for a new kind of authoritarianism in which large sections of the population are increasingly denied the symbolic and economic capital necessary for engaged citizenship. Moreover, as corporate power gains a stranglehold on the media, the educational conditions necessary for a democracy are undermined as politics is reduced to a spectacle, essentially both depoliticizing politics and privatizing culture. This series addresses the relationship among culture, power, politics, and democratic struggles. Focusing on how culture offers opportunities that may expand and deepen the prospects for an inclusive democracy, it draws from struggles over the media, youth, political economy, workers, race, feminism, and more, highlighting how each offers a site of both resistance and transformation.